Results are now final, with just one change. Just a reminder that lost and found items (see photo in update #1) are at Gazelle Sports Grand Rapids but can be delivered to their Holland and Kzoo stores. One more found item turned up: a gray winter hat from Old Navy. Several helmet straps broke this year. If you have old helmets lying around or even the snap system for the chin strap and you’re willing to give them new life in the next Winter Edition, email me. A batch of 200-400 photos will be posted to Flickr in the next few weeks. It takes Jamie Geysbeek a lot of time to retouch photos and get them just right. I will let you know via Facebook when they are uploaded. We ran out of MI Adventure Racing buffs at the race. D’oh. If you would like to buy a buff and can pick it up at a Gazelle Sports store (West MI only), mail a check for $10 written out to Michigan Adventure Racing and send to Mark VanTongeren, 562 Hartfield DR, Ada, MI 49301. Indicate on the check or note which store and I’ll get it to you. We can do this with pints ($8), stickers ($3) and sweatshirts too ($25, email me re sizes; out of mediums). Thanks for raising a record-breaking $909 in the charity challenge. Along with race proceeds we raised $1980 for kids to go to summer camp at Camp Roger who normally would not be able to. We’re always looking to improve so thanks to the 65 of you who filled out the survey (and thanks to those who didn’t as I really don’t want to go through 440 surveys!). Most important to us is the overall race experience. 82% of you ranked the race as Very Good, 17% ranked it Good, and one person had it as average. So 99% thumbs up which is good to hear. Still some things to work on, below. Slingshots and fatbiking were the top challenges. Others were ranked just behind. The maze got lots of very good rankings but also some poor rankings due to the ice. By the way, this is a Camp Roger-built challenge that campers do each summer so we can’t take credit for it. I do wish that we had designed Egg Drop Goop so that there was a way to get the checkpoint even if both eggs cracked. Someone suggested a time penalty which would have worked. Next time. Great volunteers and the sportsmanship shown between teams. The venue’s lack of space. The pre- and post-race space will not be an issue in future years once the huge new hall is finished. The course’s lack of space. Unless we shuttle you to another area (which we’ve done before but is tricky and not appealing to many), we are working with the same land. If you know of another location in the area that has more public land with definable terrain, a large facility and parking on site or nearby, we’re all ears (Fallasburg Park lodge is closed in winter; that was my next best option). Camp Roger has a lot of benefits so we are sticking here for at least one more year. Do the raffle earlier. The soonest it can start is 12:51 when the last team must be back. I wanted to give them a few minutes to change and get some food. Maybe I waited too long before starting. Will try to start earlier next time. Spread out challenges. Four reasons we don’t. One, the structures at Camp Roger (maze, treehouse, target area) make for good challenge locations. 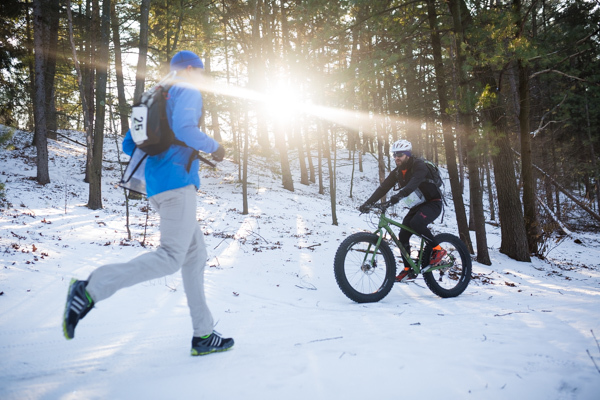 Two, fatbikes and snowshoes are not easy to transport to far off locations. Three, challenges that are far away can be difficult for volunteers to locate. And four, if there’s a problem, nearby challenges can be reached quickly. We can space challenges out in warm-weather races much more easily because volunteers can drive to them. Some of you were frustrated with the slowness of the results. We were as well. Google Docs crashed several times delaying the results. As for the person who insisted we get an e-punch system, the cost will be over $25,000 (wanna write a big, fat check?). We’ve been told there are lots of cases of racer error that results in checkpoints not being counted. Racers must use e-punch AND the punch to be sure their punch is counted. So it’s not a simple answer but we continue to evaluate, realizing that everyone would have to pay for it over time (we don’t get rich putting on these races). Only one of you mentioned the shirts, and that person mentioned having a sizing chart online for them. Good idea. We had been providing this chart with our warm-weather shirt but I forgot for this new shirt. Sorry about that and sorry again for not knowing about the sizing ahead of time so I could alert you. Next year your preference is for a shirt with warmer, softer material like the Gildan shirt, but we’ll look at a few other options and make sure we know the sizing. We were surprised to find that the challenges do not have any effect on most of you and your decision to race at the Epic Edition. There were almost equal numbers of people more likely and less likely to do that race based on our decision to not include challenges. My decision to not include challenges is based on the absolutely amazing natural terrain that lends itself to great checkpoint locations (as well as the likelihood of fewer volunteers further from the Grand Rapids area). You’ve got your first race under your belt and some of you are scratching your head wondering how to get better, especially if you know you won’t be getting much faster. 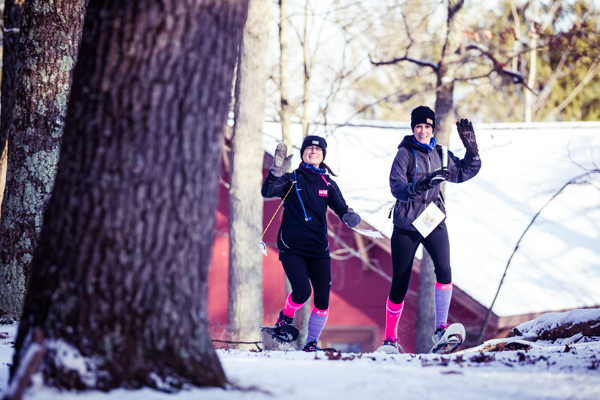 That’s the great thing about adventure racing — the smartest, most efficient team often beats the speediest team, especially in longer races with more navigation and route options like the Epic Edition and Sleeping Bear Edition (the Winter Edition is somewhat of a track meet; hard to avoid that). Here are some sources for developing your AR skills. Michigan Adventure Racing Navigation 101/201 Presentation. Start with slide 5 for the strategies: attack points, aiming off, collecting features, catching features, handrails, relocation. High Profile Adventure Camp. The longest running adventure camp in the U.S. gives aspiring first timers to experienced racers the skills and knowledge needed to participate and excel in adventure races. Camp Benson, IL, April 1-3. You may not have gotten down to 1, 2 and 3 but these CPs provide a good example of multiple route options and ways to “attack” or approach checkpoints. If you’re coming from the north, you have several options. One would be to head to 3 as the blue trail gets closer to it, ideally from the kink in the trail reflected on the map (route NOT shown). Look for the reentrants dropping down to narrow in on 3, return to the trail and head over to 1. To get 1, you could follow the trail down the valley and get 1 from below, but that’s more climbing and will sap energy. Better to stay high and drop into the reentrant from above. From 1, you have several options. Take the trail back toward 3, take the trail south and east before turning north along Pickerel Lake for faster running, or head cross-country to the northeast since vegetation is light and to cut distance, dropping down to the lake before following the trail north to 2. Or do none of these things. What I would do is take the route shown in blue. Bypass 3, run to 1 via trail, grabbing it from above. Note that there are two reentrants here and I want the second, narrower one. After getting 1, I run back the way I came. Once I see the trail heading due west, I know I’m close to where I have to head off-trail to the northeast. I have now moved out of the hardwood forests and into more open land, however I note that the map is from 1980 so some of these trees are 35 years old – it may still feel like woods. If the map is correct, there’s a “kink” to the north of the west-bearing trail so I’ll head off-trail to the northeast at that point (if I don’t see a kink, I’ll still head off trail very soon). I’ll keep the land dropping down on my right as a “handrail” (drops down about 50 feet until it levels off; notice how all the land drops toward water (Pickerel Lake) and rarely the other way around. I skirt around the larger reentrant and drop in on the second, smaller one to grab 3. I pop back up on the plateau and head east to find the top of the valley where challenge A is located. I take a quick bearing, maybe due east, and err a little bit on the right side so I don’t miss the reentrant – this is called “aiming off.” I work on the challenge from the top of the valley down so my running is all downhill from 3 to 2 and really it’s all flat or downhill for almost this entire sequence. I head east and north from 2/A. Note that these decisions may be different if you’re coming from the other way. Going from 2 to 3 is uphill. I would then look at the rest of my route to figure out if it flows better clockwise or counter-clockwise. It may depend also on challenges and when I think they will be least busy. For me, I like the flow counter-clockwise, primarily because of the downhill flow of 12 to 11 (paintball challenge to base of reentrants), 9 to 10 (hilltop at ski lift to reentrant near lodge), and 3 to 2. It feels like counter-clockwise has the steepest drops the more gradual climbs. Gradual climbs take less energy than steeper climbs, especially in slippery conditions, even if the elevation is the same. That doesn’t mean clockwise is wrong, but I may have gained an advantage by heading downhill on the steeper terrain (unless I fall on my arse). Gotta love it when our long-lost sun comes up just before the start of a race! We hope you had a great experience. Sounds like most of you did. You were a great group to work for. Adventure racers are a different breed. I don’t want to get into comparisons with other events, but it just seems like it’s a different vibe with adventure races and racers. It’s competitive and you worked your arses off out there, but in the end it’s much more about the wilderness adventure, the community and the memories formed at each of these races. That’s what makes it so easy for us to put in several hundred hours of work to make these races a fun, quality experience (for the most part but we always find things to improve upon). A special congratulations to the 195 first-time racers who we will now refer to as “seasoned veterans.” If you struggled out there, start with reviewing our Navigation 101/201 clinic presentation. You can email or Facebook me questions as well. 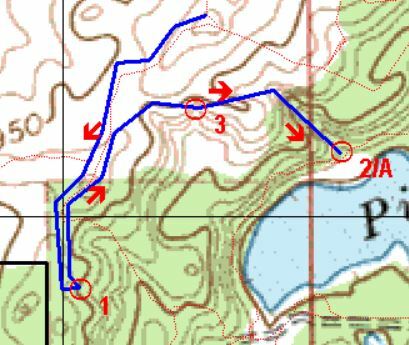 One great way to practice is to download the free Terrain Navigator Pro app for your phone. You can then hike through the woods in any public area and see how the topo map looks compared to the real terrain, plotting CPs and creating practice courses. Whether you came in early with a few CPs or got them all, you are winners for taking on a challenge that’s really intimidating until you do it. The fantastic volunteers, including those from Camp Roger. We’ll be sending your charity challenge contributions (thanks!) and a share of the race profits to their scholarship fund for kids who otherwise wouldn’t be able to go to summer camp. 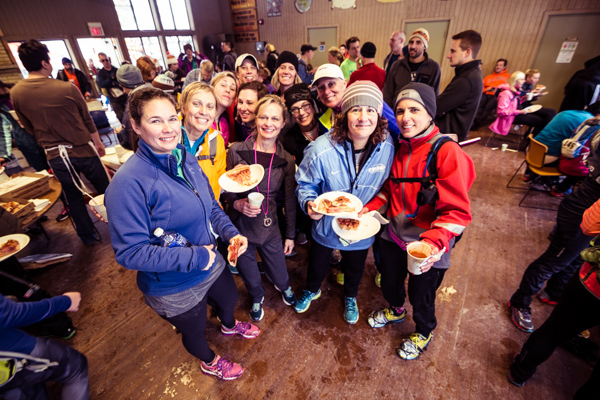 Another way to support Camp Roger is Joe’s Big Race, an adventure race on April 23 with a totally different but fun format. All of you who brought the tasty sides and treats. And the fatbikes and anything else I’m forgetting. Camp Roger, Kent County Parks and Cannonsburg Ski Area (new owner of Pando) for use of their beautiful land. If you have a minute, post a thank you on Kent County Parks Foundation’s Facebook page and consider getting involved. Support Cannonsburg Ski Area which has allowed access to their great land adventure racing, mountain biking, trail running and more for many years. They’ve added an awesome zipline experience and tubing as well in the past year. Check them out. Thanks to Jamie Geysbeek Photography for the race photos.The first batch is on our Facebook pageand more will come via email and Flickr down the road.